Bonfires currently respawn enemies. Thus, once you reach the Firelink Shrine, use the bonfire. Then, teleport back to the first area and all the enemies will have respawned. You can kill them again with minimal difficulty and work your way back to Firelink Shrine. Repeat this as many times as desired. This can be done with any bonfire to respawn enemies. To get more HP and survive longer, ember yourself while doing this. After you ember yourself, use a dried finger. This increases the amount of souls you gain for a limited time, but you have to be embered for this to take effect. Additionally, equip the Covetous Silver Serpent Ring to get even more souls between rests at the bonfire. Note: This exploit was performed on patch 1.04 of the game. It will eventually get patched. To avoid not being able to use this exploit, either do not install new patches before using this exploit or delete the patches. You can avoid patches being installed by disconnecting from the internet until you are ready for the game to install new patches. This exploit can be used with any of the Boss Souls you acquire after defeating a Boss. It can be very difficult to do at first, but once you get the timing down it becomes much easier. First, clear the tool belt of any items. Next, add an empty estus flask to your tool belt slot. Equip a shield that lets you parry (for example, the Knight’s starting shield). Then, add a Boss Soul to one of your quick item slots. Make sure there are no other items in your quick item slots. Finally, while holding D-pad Down the entire time, perform a parry (LT), then during the parry (when the shield is parallel to your character’s shoulder — just one frame before he starts to drop it down), very quickly press X, Start, A. Another method is while holding D-pad Down the entire time, press LT, then quickly press X(3), Start, A. If done correctly, the equipment box will appear for a split-second and you will get a prompt to use the soul and the HUD (that displays the quick item slots with the Boss Soul in it) in the bottom left corner will have disappeared. If you do not see the equipment box briefly appear and the HUD is still visible, select “No” when prompted to use the soul. Otherwise, you will use the soul and not retain it. If the equipment box did appear briefly during the button sequence and the HUD has disappeared, select “Yes” to use it and get a lot of souls and still have the Boss Soul equipped. Repeat this process as many times as desired. Note: It is recommended to create a cloud or USB backup of your saved game before attempting this exploit. Thus, if you make a mistake you can restore your saved game from the cloud or USB and try again. Additionally, this glitch was performed on patch 1.03 of the game. It may get patched. To avoid not being able to use this exploit, either do not install new patches before using this exploit or delete the patches. You can avoid patches being installed by disconnecting from the internet until you are ready for the game to install new patches. Soul of the Dancer: Soothing Sunlight, Dancer’s Enchanted Swords, or broken into 10,000 souls.Soul of High Lord Wolnir: Wolnir’s Holy Sword, Black Serpent, or broken into 10,000 souls.Soul of Boreal Valley Vordt: Vordt’s Great Hammer, Pontiff’s Left Eye, or broken into 2,000 souls.Soul of the Rotted Greatwood: Hollowslayer Greatsword, Arstor’s Spear, or broken into 3,000 souls.Soul of the Blood of the Wolf: Farron Greatsword, Wolf Knight’s Greatsword, or broken into 20,000 souls.Soul of the Deacons of the Deep: Cleric’s Candlestick, Deep Soul, or broken into 20,000 souls.Soul of a Demon: Demon’s Greataxe, Demon’s Fist, or broken into 20,000 souls.Soul of Aldrich: Lifehunt Scythe, Darkmoon Longbow, or broken into 15,000 souls.Soul of a Crystal Sage: Crystal Sage’s Rapier, Crystal Hail, or broken into 3,000 souls.Soul of Pontiff Sulyvahn: Greatsword of Judgment, Profaned Greatsword, or broken into 12,000 souls.Soul of the Old Demon King: Chaos Bed Vestiges, Old King’s Great Hammer, or broken into 10,000 souls.Soul of a Stray Demon: Havel’s Ring, Boulder Heave, or broken into 20,000 souls.Soul of Yhorm the Giant: Yhorm’s Great Machete, Yhorm’s Greatshield, or broken into 20,000 souls.Soul of Dragonslayer Armour: Dragonslayer Greataxe, Dragonslayer Greatshield, or broken into 15,000 souls.Soul of Consumed Oceiros: White Dragon Breath, Moonlight Greatsword, or broken into 12,000 souls.Soul of Champion Gundyr: Gundyr’s Halberd, Prisoner’s Chain, or broken into 20,000 souls.Soul of the Twin Princes: Lothric’s Holy Sword, Lorian’s Greatsword, or broken into 20,000 souls.Soul of the Nameless King: Storm Curved Sword, Dragonslayer Swordspear, Lightning Storm, or broken into 16,000 souls.Soul of the Lords: Sunlight Spear, Firelink Greatsword, or broken into 20,000 souls. Applause: Speak with Leonhard after he appears at Firelink Shrine and get the Cracked Red Orbs. Then, talk to him again to get the key to the locked door under the Tower on the Wall Bonfire in High Wall of Lothric leading to Darkwraith. Kill the Darkwraith to get a Red Eye Orb then speak with Leonhard again to learn the gesture.Beckon: Speak with Yoel of Londor near the Foot of the High Wall Bonfire.By My Sword: Summon Black Hand Gotthard and he will perform the gesture.Call Over: Trade a Homeward Bone with the crows.Collapse: Meet with Hawkwood.Curl Up: Give Greirat of the Undead Settlement a Loretta’s Bone.Darkmoon Loyalty: Speak with Sirris in Firelink Shrine.Dignified Bow: Meet the Yuria of Londor.Duel Bow: Get five Dark Sigils by leveling up with Yoel. Then summon the Londor Pale Shade, who appears at various locations.Hurrah! : Speak with Blacksmith Andre.Legion Etiquette: Pray to the Old Wolf statue found in the Farron Swamp.My Thanks! : Fight the Knight Slayer Tsorig in the Demon Ruins.Patches Squat: Speak with Patches at the Firelink Shrine.Path of The Dragon: Learned from corpse after Oceiros, the Consumed King. It is required to access the Archdragon Peak.Praise the Sun: Pray at the Altar of Sunlight in Lothric Castle.Prayer: Meet with Irina.Proper Bow: Kill Heyzel in the Farron Keep and get a Pale Tongue to the Rosaria’s Fingers Covenant. Extinguish three flames and you will see her summon sign at Keep Ruins Bonfire. Summon her to get the gesture.Prostration: Reply negatively to Patches when he apologizes.Quiet Resolve: Speak with Horace at the Halfway Fortress Bonfire.Rejoice: Obtained during the Siegward questline.Rest: Rest at a Bonfire.Silent Ally: Obtained from Orbeck of Vinheim after he relocates to Firelink.Sleep: Learn Toast from Siegward of Catarina then speak with him again after he has gone to sleep.Stretch Out: Go to the Profaned Capital near the first Bonfire and learn it near the corpse found there.Toast: Speak with Siegward of Catarina after killing the demon.Welcome: Speak with Cornyx in the Undead Settlement, then at the Firelink Shrine. The End Of Fire: You must find the hidden eyes in the Untended Graves area to get this ending, which is the dark version of the starting area. Use the “Finding Untended Graves secret area” hint to find out how to reach that area. Once you reach that area, go to the shrine and hit the illusion wall downstairs to reveal the eyes. Collect them and travel back to the real Firelink Shrine. Give the eyes to the fire keeper. Then, kill the final Boss (Soul of Cinder). You can then either light the bonfire or summon the fire keeper. To get this ending, you must summon the fire keeper (do not interact with the bonfire). She will only be available when you have given the eyes to her. Step 1: Recruit Yoel on the bridge of “Foot Of The High Wall” bonfire.Step 2: Talk to Yoel in the Firelink Shrine and let him give you a free level up.Step 3: Kill yourself eight times in a row (jump off the cliff).Step 4: Level up four more times at Yoel (every two deaths is one level up).Step 5: Yoel will now die and is replaced by Yuria in the Firelink Shrine. Talk to Yuria (fast travel back and forth so she spawns).Step 6: Talk to Anri (a knight) at the “Halfway Fortress” bonfire (Road Of Sacrifices area).Step 7: Kill the Deacons Of The Deep Boss (Cathedral Of The Deep area).Step 8: Talk to Anri in the Firelink Shrine after defeating the Deacons Of The Deep Boss.Step 9: Talk to Anri near Catacombs Of Carthus entrance after killing the Lord Of Cinder: Abyss Watchers Boss.Step 10: Talk to Anri further down in the Catacombs (by the hanging bridge before the Wolnir Boss).Step 11: Kill Horace down in the area where you fight the Old Demon King Boss (destroy hanging bridge to climb down there).Step 12: Return to Anri and talk to her.Step 13: Talk to Anri at the “Church Of Yorshka” bonfire (Irithyll Of The Boreal Valley area).Step 14: Kill the Pontiff Sulyvahn Boss (Irithyll Of The Boreal Valley area).Step 15: Talk to Yuria in the Firelink Shrine.Step 16: Marry Anri in the room below the “Anor Londo” bonfire (Irithyll Of The Boreal Valley area).Step 17: Talk to Yuria one last time in the Firelink Shrine.Step 18: Proceed through the game and kill the final Boss (Soul Of Cinder). Then, interact with the bonfire in front of you to trigger “The Usurpation Of Fire” secret ending. To reach the Archdragon Peak secret area, you must defeat “Oceiros, the Consumed King” Boss. This is relatively late in the game. Oceiros is Boss 13 of 18. Open the door in the room where the Boss fight took place. It will lead you to the “Old Dragon” gesture that you must collect. This gesture is very important for the next step. Travel to the Irithyll dungeon. Progress through the dungeon until you reach a lookout with a dragon statue (there is also an elevator nearby). Use the Old Dragon gesture at this spot to trigger a cutscene and reach the hidden Archdragon Peak area. Go up the hill a little bit to get the “Archdragon Peak” achievement. To reach the Untended Graves secret area, you must defeat “Oceiros, the Consumed King” Boss. This is relatively late in the game. Oceiros is Boss 13 of 18. There is also a bonfire in the Boss room which you can use to fast travel. Open the door where the Oceiros Boss fight took place and follow the path into the next room. There is a secret wall behind a chest (end of the room). Hit the wall to make it disappear. You can then drop down into the Untended Graves area and will get the “Untended Graves” achievement. You can reset skill points in the “Cathedral Of The Deep” area, which is the area where you fight the Deacons of the Deep Boss. The nearest bonfire is called “Cleansing Chapel”. Take the elevator up to the Cathedral’s rooftop, and climb up the ladder to the very top. You then need to drop down to a small balcony in the Cathedral’s main hall and again from the balcony to an area below. The path leads to a room with a hidden bonfire and a worm-like being named Rosaria. Talk to Rosaria, and she will let you join her covenant (Rosaria’s Fingers). You can then talk to her to respec skill points and change your character’s appearance. Note: You only have a total of five resets — so make sure to use them wisely. Way Of Blue: This is the first covenant you can join. It is found in the “High Wall Of Lothric” area. Go down to the large courtyard of the area where you fight Vordt of the Boreal Valley. There is a big church with a woman sitting on a chair inside. Talk to the woman a few times. She will first gives you a banner and then the covenant. Mound-makers: This covenant is missable. If you have missed it, you can do it in New Game+. Do it as soon as you reach the Undead Settlement, before defeating the Curse-rotted Greatwood Boss. Once you have defeated the Greatwood Boss, it will no longer work. From the “Undead Settlement” bonfire, go through the dark building and then across the bridge on the right. Follow the narrow path around the hill and climb the rooftops where archers are shooting at you. You can then drop to an area with a big guy who has a cage on his back. Enter the cage (do not attack him) to trigger a cutscene. You will then be brought to the area where you would later fight the Curse-rotted Greatwood Boss. Talk to the man near the shrine and he will let you join the covenant. Note: After you have defeated the Greatwood Boss, there is still a way to join the convenant. Sometimes there will be a summoning sign on the ground where the Boss fight took place (on the upper floor where the ground breaks during the fight). Activating it will teleport you to the area below, where you have to defeat a mini-Boss to join the covenant. However, the summoning sign is not always there and becomes unavailable for unknown reasons. Thus, it is recommended to do it in New Game+ if you have missed it and the summoning sign does not appear. Warrior Of Sunlight: This is the third covenant you can join. From the “Undead Settlement” bonfire, proceed through the dark building and keep going straight. There are some houses down the hill. In one dark house there is a hole in the floor. Drop down the hole and collect the covenant from the table. Blue Sentinels: This is the fourth covenant you can join. It is very easy to find. After defeating the Curse-rotted Greatwood Boss, you will reach the “Road Of Sacrifices” area. At the “Halfway Fortress” bonfire, you will meet two people. Talk to them to join the covenant. Watchdogs Of Farron: This covenant is missable. Sometime after killing the Lords of Cinder: Abyss Watchers Boss, it will not be available any longer. Make sure to get this covenant immediately when entering the swamp area. If you miss it, you can still get it in New Game+. The covenant is located in the “Road Of Sacrifices” area, near the “Keep Ruins” bonfire (poison swamp area). Walk around the ruins until you find a ladder. Go up the ladder to see a sleeping wolf. Pray to the wolf to join the covenant. If you cannot pray to the wolf, it is because he has been killed by an NPC. After defeating the Abyss Watchers, an NPC will come at some point during the game to slay the Wolf (the exact time seems to vary, but it can happen after the Boreal Valley Dancer). Rosaria’s Fingers: This is the sixth covenant you can join. 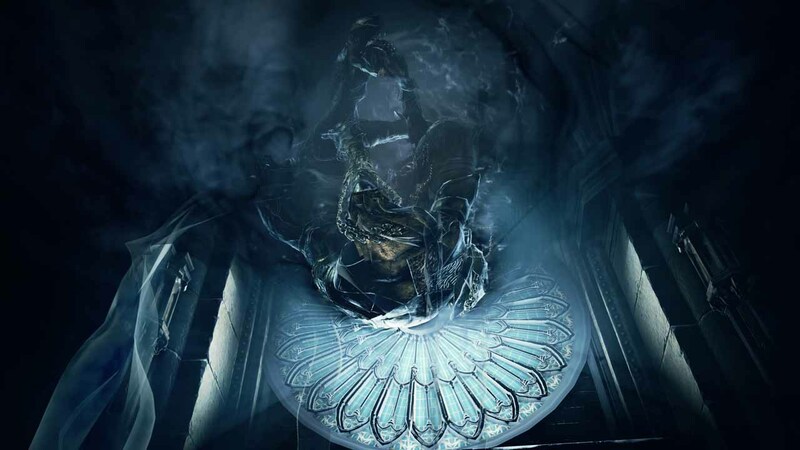 It is found in the “Cathedral Of The Deep” area, near the “Cleansing Chapel” bonfire. After defeating the Deacons of the Deep Boss, take the elevator up to the Cathedral’s rooftop, and climb up the ladder to the very top. You then need to drop down to a small balcony in the Cathedral’s main hall and again from the balcony to an area below. The path leads to a room with a hidden bonfire and a worm-like being named Rosaria. Talk to Rosaria, and she will let you join her covenant (Rosaria’s Fingers). She also allows you to reset your skill points and character appearance up to five times. Aldritch Faithful: This is the seventh covenant you can join. It is found in the “Irithyll Of The Boreal Valley” area, near the “Pontiff Sulyvahn” bonfire. After defeating the Pontiff Sulyvahn Boss, go outside and proceed through the courtyard with the dead giants on the floor. Go up the stairs to the tower entrance. There is an illusion wall on the left side of the tower (do not go up the stairs yet). Hit the wall to reveal a ladder that leads down to a flooded area with two large dogs. There is a puppet sitting in the corner. Pray to the puppet to join the covenant. Blade Of The Darkmoon: This is the eighth and final covenant you can join. By this point in the game you should already be part of all the other covenants. Blade Of The Darkmoon is found in the “Irithyll Of The Boreal Valley” area, near the “Anor Londo” bonfire. From this bonfire, go back down the stairs of the tower. After going downstairs, watch out for a bonfire on a nearby tower. There is an invisible bridge you can walk across. Even if it looks like you are going to fall down, you will not. Just walk over the edge to walk in the air. Drop down to the tower with the hidden bonfire. There is a lady in a white dress in this area. Talk to her. If you have the bowing gesture from Yuria’s quest line, she will let you join the covenant. If not, simply kill her and pick up the covenant item from her dead body. Get close to the nest above Firelink Shrine to talk to Snuggly the Crow. He will trade items for specific things that are dropped in her nest with the “Leave” item option in your inventory. Note: You can only do one trade per playthrough, but this resets with each New Game+. Additionally, make sure not to exit the game with an item still resting on the ground before the trade has been completed or you will lose it. Search the indicated locations to find all 11 Estus Flask Upgrade Shards. Collect all of them to get the “Ultimate Estus” achievement. Give them to the blacksmith in the Firelink Shrine to increase the number of flasks you can carry. You begin with 3 estus and 1 ashen flask. Combined with the 11 Estus Shards, you can carry a total of 15 flasks. Since these are your health/mana potions, it is recommended to collect all of them as soon as possible. It will help you survive longer and makes things in general easier. This video shows the locations in the order in which you can obtain them. You can still collect all of them after defeating the final Boss. You can view how many you have collected by looking in your inventory. You can turn Ashen Flasks into Estus Flasks and vice versa at the blacksmith. Note: You also must collect the ten Undead Bone Shards to increase the amount of HP/FP restored with each flask use. Search the indicated locations to find all ten Undead Bone Shards. Collect all of them to upgrade your Estus Flask and get the “Ultimate Bonfire” achievement (reinforce a bonfire to the highest level). After finding a Bone Shard, you can burn it in the bonfire of the Firelink Shrine (the hub area where you level up). This will increase the bonfire’s intensity and improve your Estus Flask so that it heals more HP with each use. You will get the achievement after burning all ten shards. Note: It is recommended to collect all of these upgrades as soon as possible. They greatly help in completing the game and make things easier in general. This video shows the locations in the order in which you can obtain them. You can still collect all of them after defeating the final Boss. They also respawn in New Game+. To see how many you have collected, check the number below your Estus Flask or view the bonfire intensity in the Firelink Shrine. Soul of Cinder is the final story Boss. After defeating him, you can interact with the last bonfire (same place where you fight him) to trigger the game ending and start New Game+. He uses a variety of attacks and weapons that he is always switching around. A recommended strategy is to take Havel’s Greatshield (any greatshield will do) and walk close to him in circles while blocking all attacks. After blocking his combo, attack him 1-2 times and block again. After a few hits, he will get stunned and you can take down a good chunk of his health. Just keep it slow and block, do one hit and repeat. In between his attacks, you should release [Block] so your stamina recovers quicker. When he uses magic, you can get up close to him and just attack. After his first health bar is gone, he gets more aggressive. His available attacks change slightly. He uses longer combos and throws lightning spears at you. When he uses lightning he is vulnerable — that is when you should attack even if he hits you a few times. Roll away from him when he does the 5-hit sword combo with the big fire explosion. Everything else you can block with the shield. You just have to learn how to balance your stamina for this fight so you have enough to block, but also enough to get one hit in. Keep your equipment load below 70% to speed up stamina recovery. You should definitely put a few points in stamina before this fight. The Dark Soul (70 points): Complete all achievements.Supreme Weapon Reinforcement (30 points): Reinforce any weapon to the highest level.Master of Infusion (30 points): Perform all forms of infusion.Master of Sorceries (30 points): Acquire all sorceries.Master of Pyromancies (30 points): Acquire all pyromancies.Master of Miracles (30 points): Acquire all miracles.Master of Rings (30 points): Acquire all rings.Master of Expression (30 points): Learn all gestures.Ultimate Bonfire (30 points): Reinforce a bonfire to the highest level.Ultimate Estus (30 points): Reinforce the Estus Flask to the highest level.Enkindle (15 points): Light a bonfire flame for the first time.Embrace the Flame (15 points): Become a Host of Embers for the first time. 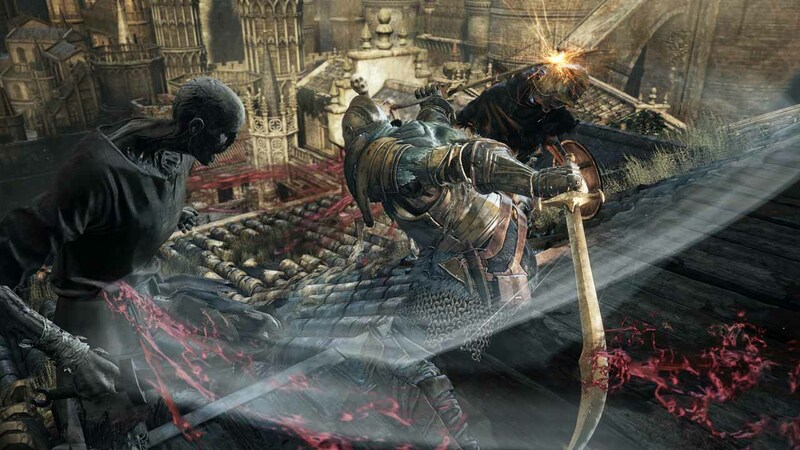 To Link the First Flame (50 points): Reach “To Link the First Flame” ending.The End of Fire (50 points): Reach “The End of Fire” ending.The Usurpation of Fire (50 points): Reach “The Usurpation of Fire” ending.Lords of Cinder: Abyss Watchers (30 points): Defeat the Abyss Watchers, Lords of Cinder.Lord of Cinder: Yhorm the Giant (30 points): Lord of Cinder: Yhorm the GiantLord of Cinder: Aldritch, Devourer of Gods (30 points): Defeat Aldritch, Devourer of Gods, Lord of Cinder.Lord of Cinder: Lothric, Younger Prince (30 points): Defeat Lothric, Younger Prince, Lord of Cinder.Covenant: Warrior of Sunlight (15 points): Discover Warrior of Sunlight covenant.Covenant: Way of Blue (15 points): Discover Way of Blue covenant.Covenant: Blue Sentinels (15 points): Discover Blue Sentinels covenant.Covenant: Blade of the Darkmoon (15 points): Discover Blade of the Darkmoon covenant.Covenant: Rosaria’s Fingers (15 points): Discover Rosaria’s Fingers covenant.Covenant: Mound-makers (15 points): Discover Mound-makers covenant.Covenant: Watchdogs of Farron (15 points): Discover Watchdogs of Farron covenant.Covenant: Aldritch Faithful (15 points): Discover Aldritch Faithful covenant.Untended Graves (15 points): Reach the Untended Graves.Archdragon Peak (15 points): Reach Archdragon Peak.Iudex Gundyr (15 points): Defeat Iudex Gundyr.Vordt of the Boreal Valley (15 points): Defeat Vordt of the Boreal Valley.Curse-rotted Greatwood (15 points): Defeat the Curse-rotted Greatwood.Crystal Sage (15 points): Defeat Crystal Sage.Deacons of the Deep (15 points): Defeat the Deacons of the Deep.High Lord Wolnir (15 points): Defeat High Lord Wolnir.Pontiff Sulyvahn (15 points): Defeat Pontiff Sulyvahn.Dancer of the Boreal Valley (15 points): Defeat Dancer of the Boreal Valley.Dragonslayer Armour (15 points): Defeat Dragonslayer Armour.Old Demon King (15 points): Defeat Old Demon King.Oceiros, the Consumed King (15 points): Defeat Oceiros, the Consumed King.Champion Gundyr (15 points): Defeat Champion Gundyr.Ancient Wyvern (15 points): Defeat Ancient Wyvern.The Nameless King (15 points): Defeat Nameless King.